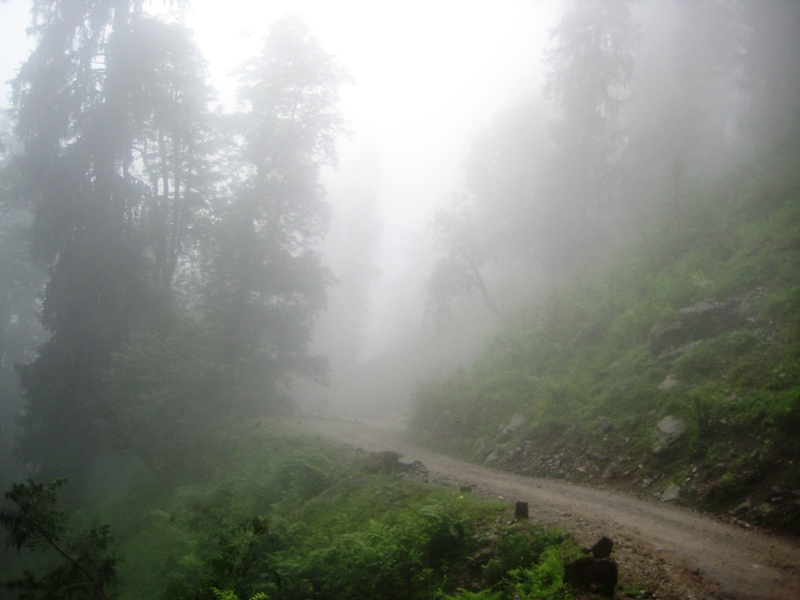 If the trip in and out of Jalori had been fraught with a sense of danger, the drive to Manali was like a breath of fresh air. 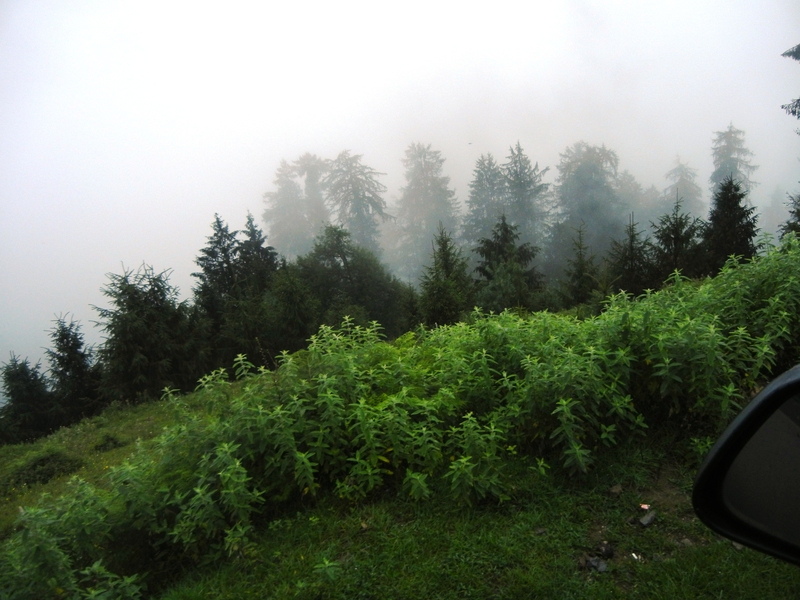 It is really no surprise that so many travelers list Manali amongst their favourite places to go to. It is a lot like a perfect Mojito – clean, clear, green and cool, with a touch of something sweet. 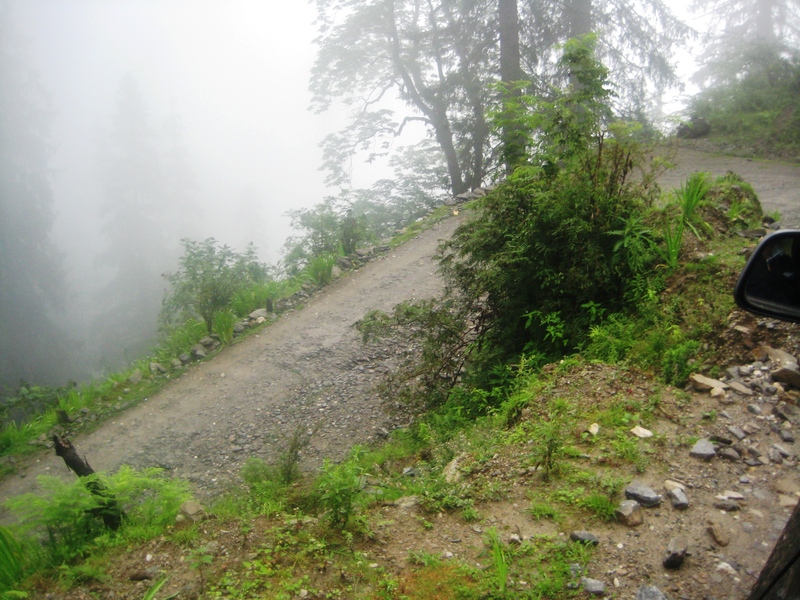 We first had to drive down a bit, cross a valley and then drive up to Manali along beautiful mountain roads that presented one with jaw dropping views at every single turn! With apologies to Robert Frost – the road not taken all that often. The drive to Manali was really special because on the way we saw (and yes this is based on what a local told us… but maybe he was just having a good laugh at the expense of these silly tourist types… I don’t know) the River Tirthan in its infancy… a gurgling, energetic stream tumbling over rocks and boulders on its way to becoming a bigger river. 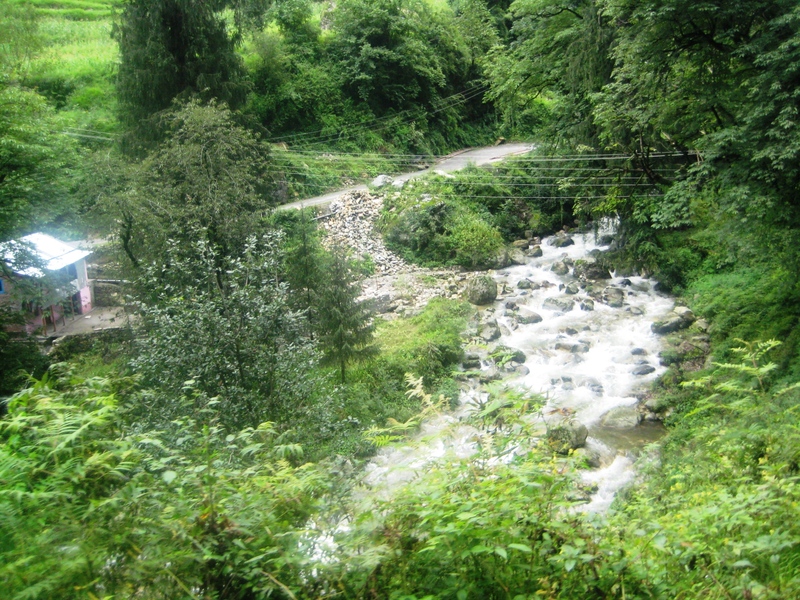 Of course in the land of Sutlej and Beas, the Tirthan is considered a small river. The locals told us that this stream goes on to become the River Thirtan. Not sure whether he was pulling our collective, ignorant touristy legs… but I like to believe that he was right. I just love the way we see things in comparison to other things. I remember this trip to Vienna and we were being taken around by my husband’s Viennese colleagues contact – Hans. Suresh and I along with two other friends (all of us based in Dubai at that point of time) were walking around with Hans and just taking in the sights and sounds of this historic city. We were so impressed with the palaces and opera houses. And then we saw another beautiful old building and asked Hans, “Tell us about that building.” Hans looks across at the building we were pointing at and just waves his hand and dismisses it saying, “Oh that! It is nothing. It is a new building. Not much story there.” The four of us look at the building and ask Hans, “New! When was it built?” Hans shrugs and says, “Oh about 100 years ago.” It took us a while to make Hans understand why the four of us burst out laughing. In Dubai, if a building is 20 years old, it is considered OLD. Of course in India, the land of Mahabalipuram, Hampi, Ajanta and Elora, even old can be broken up further in to old, really old, ancient and Baba Aadam ke zamane ka (from the time of Baba Aadam (who may or may not be the Adam of Biblical fame)). Anyway older than all these buildings and maybe Baba Aadam himself are the rivers that flow through this beautiful land. 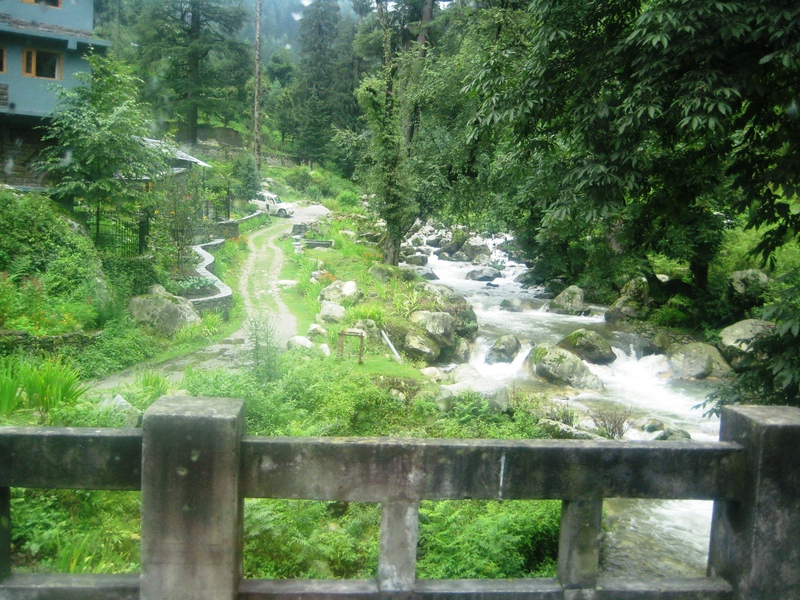 River Tirthan flows through the Tirthan Valley and originates from a spring called the Tirth. 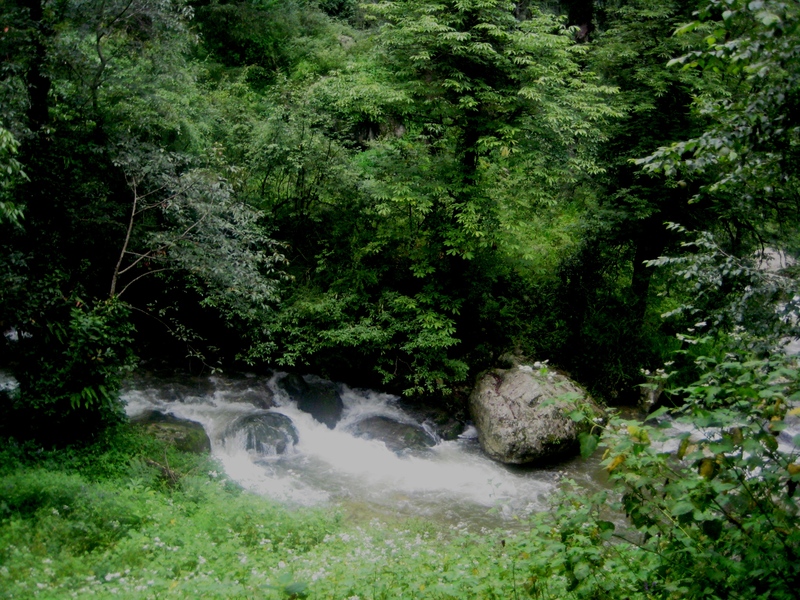 (According to the Britannica, Tirtha in Hinduism refers to a holy river, mountain, or other place made sacred through association with a deity or saint. 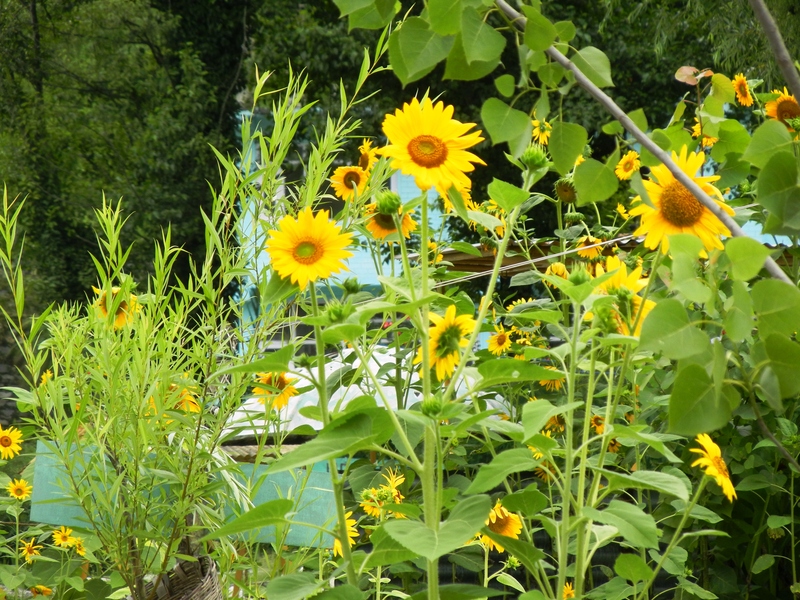 The word tirtha means literally “river ford” and, by extension, a sacred spot. Courtesy http://global.britannica.com). This river is very popular with anglers for its excellent fishing, especially the trout. Along the way we had to stop for a barf break courtesy my daughter who had feasted on cheesy Cheetos in the back seat, not realising that Cheetos, moving car and a winding mountain road don’t mix well. We were all snapped out of our dreamy admiration of the vista when Sakshi bawled “STOP THE CAR! I am feeling pukey.” We would have made army commandos the world over proud with the speed with which we stopped the car, leapt out, got the kids out from the back seat and made her puke outside the car. The motivation was high – no one wanted to spend hours in a car scented by barf. Winding mountain roads and cheesy Cheetos don’t mix well. 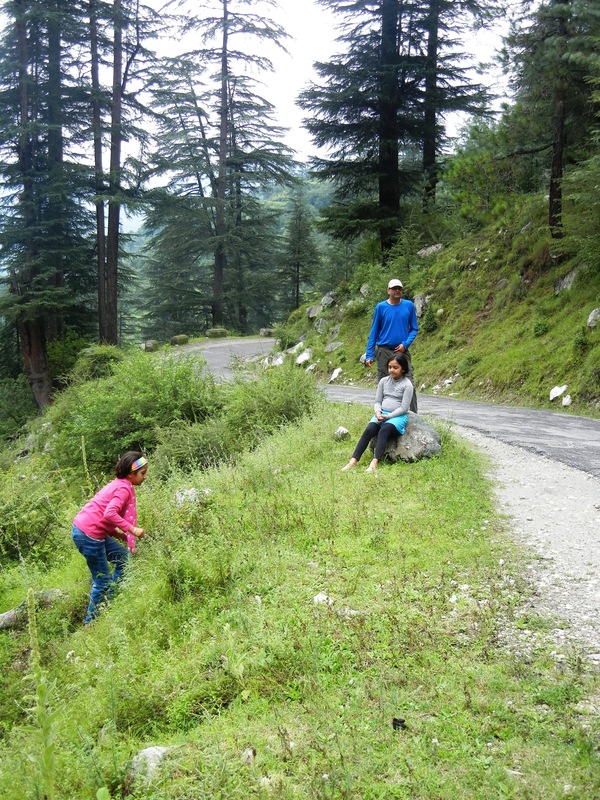 While Sakshi recovered from her motion sickness, we sat around and enjoyed the beautiful scenery. 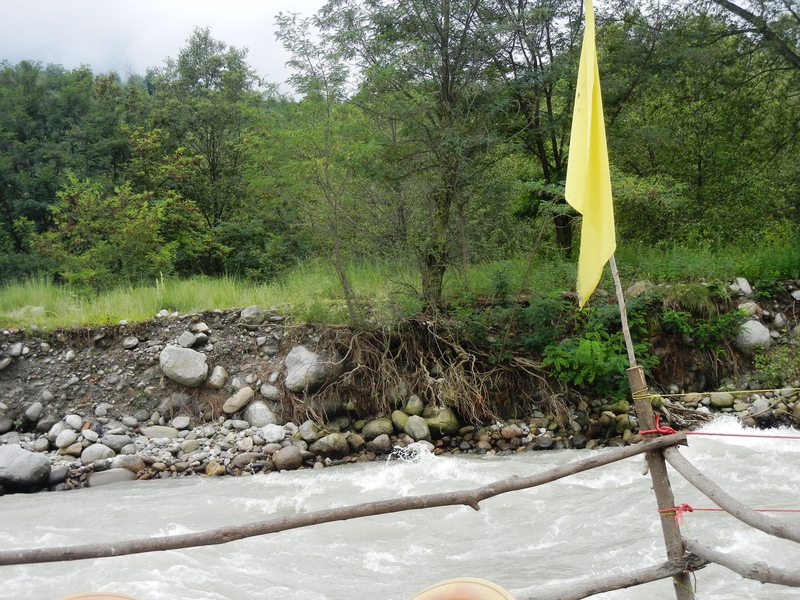 As one drives on one gets to see the confluence of the Rivers Tirthan, Sainj and the Beas. We were amazed by how different the waters of the three rivers were! At the Sangam (point where the rivers meet) you can actually see one river that is muddy, another that is almost green and the third that is blue. 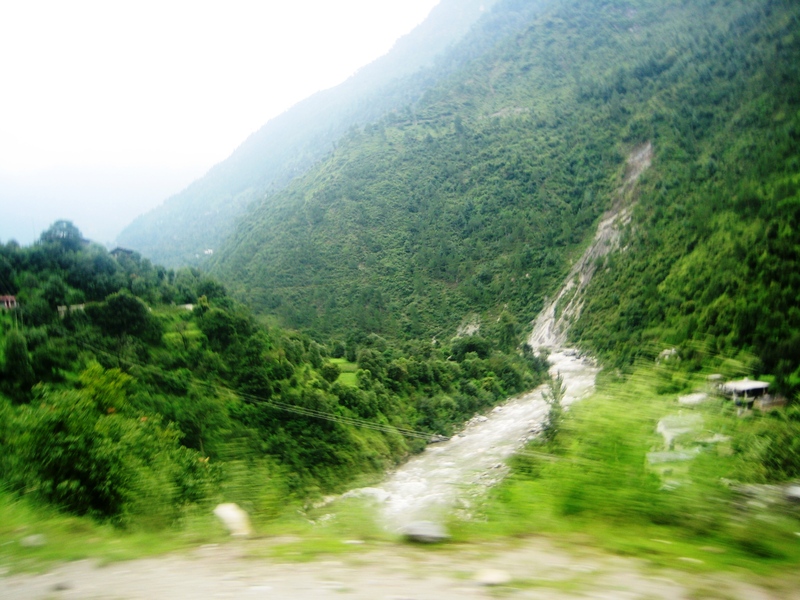 From this point we started following the River Beas and drove through the 3 kilometer long Aut Tunnel also called the Kullu Manali Tunnel on the Kullu Manali highway. Crossing the tunnel we soon reached the outskirts of Manali and enjoyed one of the highlights of the trip… Bella… River Banks. (In fact I found out later that this restaurant was also featured by Rocky and Mayur on Highway On My Plate). 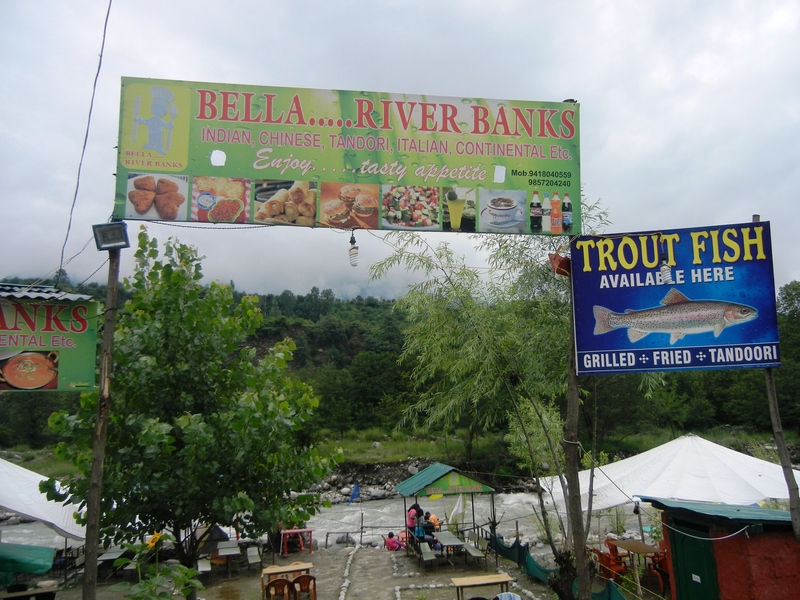 A Beas riverside restaurant, Bella boasts of the best trout ever, but the highlight for the kids (and the grownups too I must say), was that the restaurant had roped off a small section along the river bank, where one could place one’s plastic tables and chairs and lunch on freshly caught and hot off the stove food, while the ice cold water lapped at your feet. 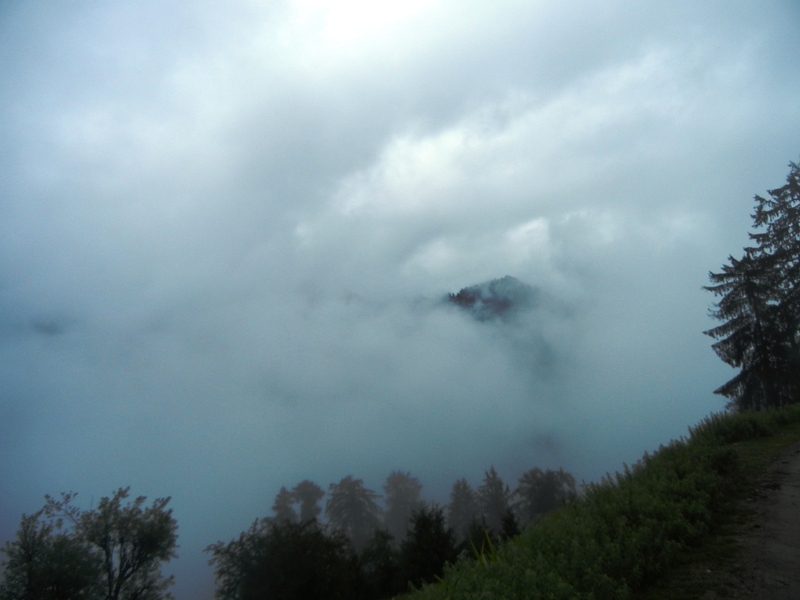 This was such a lovely beginning to our stay in Manali. The girls still talk about the fun they had. 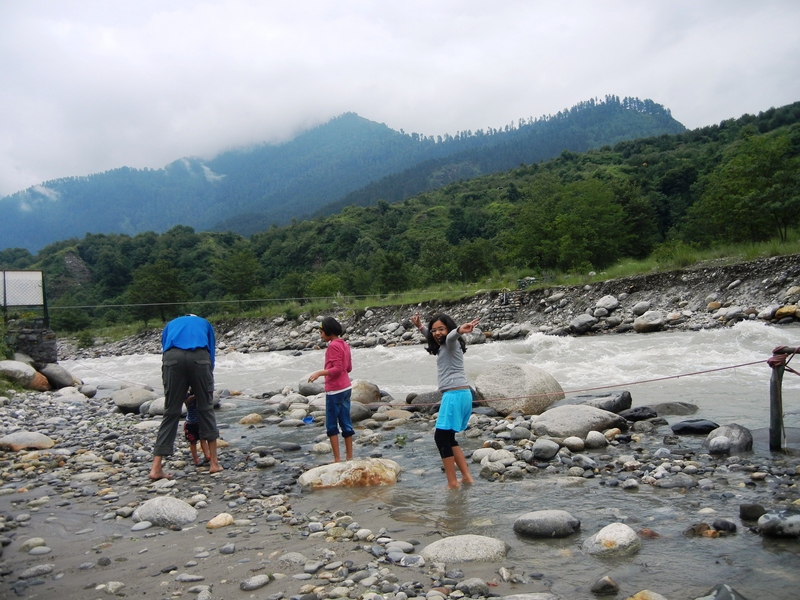 The kids had a blast running and hopping along the river bank, picking smooth pebbles and enjoying the glacial cold water. We however could only sit with our feet in the water for this long. 5 minutes later we were moving table, chair and trout to less wetter parts of the riverside. To be honest, the food was just so-so. However the ambience more than made up for it. They could have served me burnt toast and I would have considered the meal the best ever because the meal was accompanied by a cool mountain breeze, a gurgling ice cold Beas, beautiful mountains in the background, a sunflower garden nearby and so much greenery that my desert-living, greenery parched eyes, heart, mind and soul were soothed and calmed. 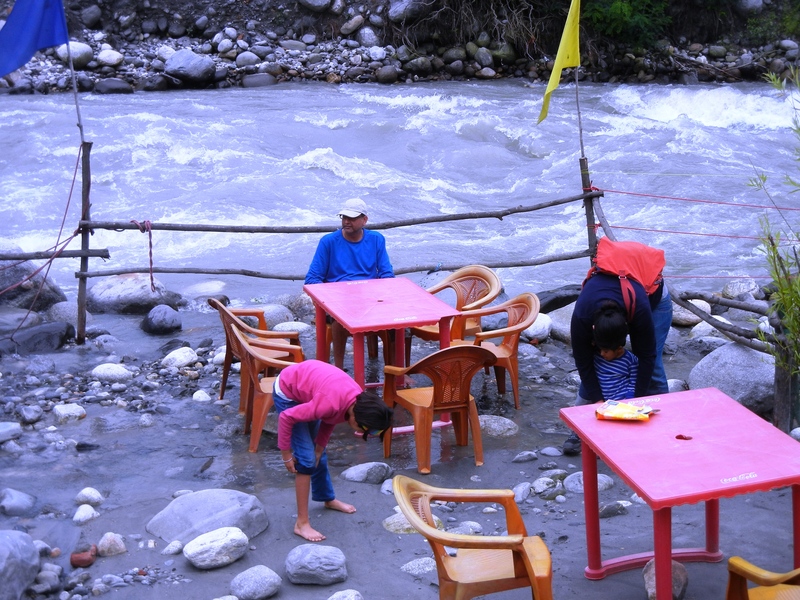 I do have to point out at this stage that keeping in mind the accident that occurred earlier this year when those students were swept away by the waters of the River Beas, we were lucky but we were also in an area that was and still is designated safe by the locals. The rather fragile wooden barricade let us know how far we could walk along the river bank without any danger to ourselves. We hung around in the restaurant for a while and then moved on. The road ahead branched towards Manali to the left and to the right the road led to Manikaran, a pilgrimage centre for Hindus and Sikhs, which I did not get the chance to visit during this trip. A popular Hindu legend is that Manu recreated human life in Manikaran after the catastrophic floods that destroyed all life. In fact this is just one of the legends that make this place so magical; there are so many more captivating stories related to this beautiful holy spot. 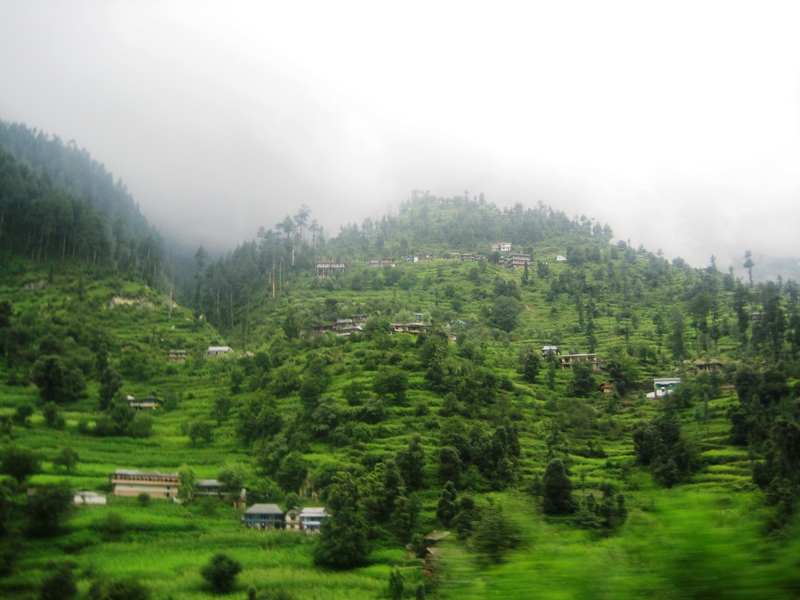 However we were on a schedule and we took the road to the left and drove into Manali – the land of Manu, ancient Deodar trees, apple orchards, momos, traditional Kullu shawls, jackets and caps, magic and our destination for the night, Mayflower Hotel.